In the last few years, the incidence of chronic illnesses has considerably increased among women. Be it the change in lifestyle or the rising geriatric populations, experts project this prevalence to continue rising in the forthcoming years as well, thus making women health rehabilitation more imperative than ever. Medical rehabilitation is a highly monitored activity considered indispensable for assisting in the improvement overall health status after a prolonged illness. Demand for women rehabilitation has therefore substantially increased in the recent years. The increasing maternal deaths, especially in developing nations, rising injuries due to road accidents, and the increasing prevalence cardiovascular ailments causing death of women have compelled governments to focus more on women health and rehabilitation. Transparency Market Research (TMR) forecasts the global women health rehabilitation products market to reach US$4.2 bn by the end of 2024, from a valuation of US$2.6 bn in 2015. The market is therefore expected to rise at a CAGR of 5.0% between 2016 and 2024. Rehabilitation has emerged as an important method of mitigating the burgeoning risk of chronic diseases among women. These services are designed to improve the overall heart health, increase metabolism, expedite faster recovery, and improve hormonal profile among ailing women. Their demand has thus increased in response to the drastically changing lifestyle and dietary preferences. Integration of advanced technologies in existing rehabilitation products has further boosted prospects for their sales. Earlier, acceptance of health rehabilitation services was a major issue across developed nations, which is now resolved with the rising awareness. However high product pricing still creates major bottlenecks for the sales of health rehabilitation products in emerging economies. Regionally, North America emerged as the key contributor in the global health rehabilitation products market in 2015, trailed by Europe. The market in North America is expected to reach US$1.5 bn by the end of 2024, from US$1 bn in 2015, rising at a CAGR of 4.9% during the period. High demand for women health rehabilitation products in both Europe and North America is attributed to the increasing number of road accidents in the last few years and the rising geriatric population. However, TMR projects Asia Pacific to exhibit the fastest CAGR due to the presence of untapped opportunities in the region. Besides this, Asia Pacific boasts a developing health care infrastructure and strong presence of skilled health care professionals, which is expected to drive demand for women health rehabilitation products in the region. By product type, orthopedic, pelvic pain product, urinary incontinence, pregnancy and postpartum, lymphedema, breast cancer, and osteoporosis constitute the major segments in the global women health rehabilitation products market. Of these, urinary incontinence held the dominant share in the market in 2015. It is also projected to maintain its lead through the forecast period. Increasing urinary incontinence among aged women is expected to keep demand from this segment high in the forthcoming years. The segment is expected to report a CAGR of 5.4% during the forecast period. This report on the women’s health rehabilitation products market analyzes the current as well as future prospects of the market globally. Rehabilitation programs include exercise training, monitoring of body vitals, education about healthy habits, and various other activities that help a patient to retain her health. Rehabilitation services include occupational and physical therapy services that help patients to recover from acute or chronic injury or illness. This research report provides a detailed analysis of the women’s health rehabilitation products market and helps understand various factors that drive the market. The market overview section analyzes market dynamics and trends such as drivers, restraints and opportunities that influence the current nature and future status of the market. Porter’s Five Forces Analysis has been covered in terms of bargaining power of buyers and suppliers, threat of new entrants and substitutes, and competitive rivalry in the global casting and splinting market. Value chain analysis and other market dynamics factors such as market attractiveness analysis have also been explained in order to deliver a thorough analysis of the overall competitive scenario of the global women’s health rehabilitation products market. This section of the report also includes key players’ product wise heat map analysis in 2015 for this market. The executive summary provides detailed insights about the report and the market in general. This elaborate executive summary provides a glimpse into the present scenario of the global women’s health rehabilitation products market, which includes a market snapshot that provides overall information of various segments and sub-segments. The executive summary also provides overall information and data analysis of the global women’s health rehabilitation products market with respect to market segments based on product type as well as geographic regions. The market size and forecast in terms of US$ Mn for each product type has been provided for the period from 2016 to 2024. 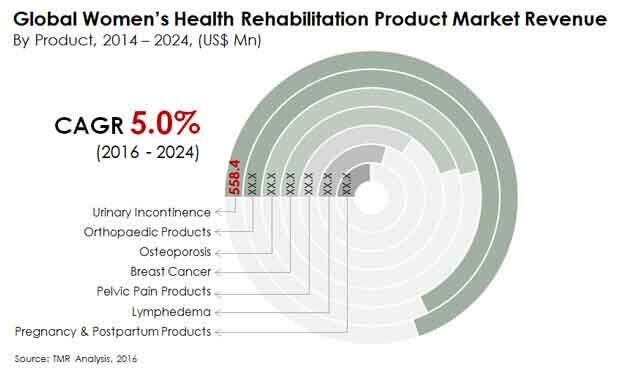 This report on the women’s health rehabilitation products market also provides the compound annual growth rate (CAGR %) for each market segment for the forecast period from 2016 to 2024, considering 2015 as the base year. Based on product type, the women’s health rehabilitation products market has been segmented in to orthopedic, urinary incontinence, pelvic pain, pregnancy & post-partum, breast cancer, lymphedema, and osteoporosis. Geographically, the market has been segmented into four regions: North America, Europe, Asia Pacific, and Rest of the World. The market size and forecast for each of these regions have been provided for the period from 2016 to 2024, along with CAGR (%) for the forecast period from 2016 to 2024. The research study also incorporates the competitive scenario in these regions.